The SAT100 extends the scope of PEGASEM’s speed sensor family to the satellite based devices. The SAT100 combines superior measuring precision used with 5th wheels with unsurpassed ease of mounting. This measuring principle offers the greatest independence from weather and road conditions. The only drawback for any satellite based speed sensor is the requirement for a free sky view. For applications where this cannot be granted the SAT100 offers an auxiliary input to connect a wheel sensor (PEGASEM WSS) or a radar speed sensor (PEGASEM GSS). This allows care-free dead reckoning in situations with a limited or missing sky view. The auxiliary sensor is permanently recalibrated when the satellite receiver works under good signal conditions. With it’s integrated display the SAT100 offers an excellent price performance ratio for professional measurement applications. In many cases it can replace conventional speed sensors based on mechanics, optics or microwave. The digital frequency and analogue speed output offers an easy connection to most data acquisition units. 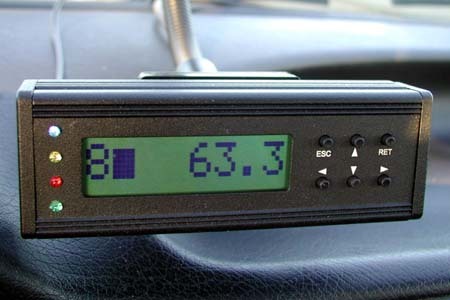 The speed and distance information is also available on the sensor’s RS232 interface for linking it to a notebook computer by an optional SB1 or SB3 interface box. It comes with BNC sockets for speed pulses and analogue speed output, PWR IN and serial interface. The PEGAVIEW software for MS Windows can display a graphical speed curve and record distance travelled from the sensor’s serial port. 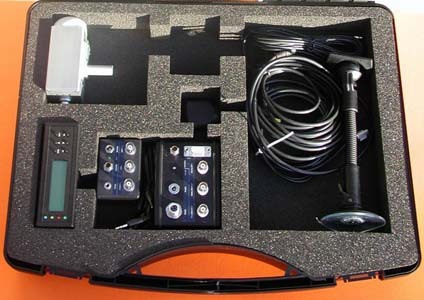 For easy transportation a case is available which carries the SAT100 receiver, antenna, gooseneck holder, cables and optional accessories, e.g. SB1 or SB3 interface box and GSS11 radar speed sensor for dead reckoning.